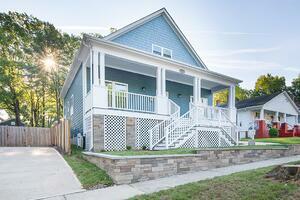 Check out this featured flip to see how a North Carolina developer tripled her purchase price. We love seeing the passion and dedication our customers have for the investment real estate industry. We chose one of the most dramatic transformations from our borrower community for November’s Featured Flip. You have to see the video to see what this developer did to triple the value of their purchase price! This total remodel project featured this month will leave you wondering if it actually was a new build. This developer did an amazing job with her house and was rewarded at the end of the sale. She recently sold for over triple the purchase price! The customer removed the roof and added a second floor to this North Carolina property, allowing her to add additional bedrooms and bathrooms. The newly remodeled bathrooms feature all-new fixtures, including modern glass showers and vanities. She also tore the back of the property out and added an additional 2,500 sq ft! The video shows the before and after of the kitchen, which went from non-functional to fit for a chef. The island makes for a great place for people to gather and adds great character to the room. We're impressed by the luxurious, spacious, and modern upgrades our developer used to totally remodel this property. Want your project to be featured by Fund That Flip? Click below to get funded with a short-term hard money loan today!